The oldest part of Cawdor castle is the keep, with the earliest records of it being mentioned in a "licence to fortify" granted to William Calder in 1454, Though architectural historians have agreed that the oldest parts of stone work in the tower house were built in 1380. There is an interesting story about why the castle was built here in the first place, with it telling of how a donkey laden with gold lay under a holly tree to rest, which was taken as a sign and the keep was built around this holly tree. Scientific testing shows that the tree died in approximately 1372, but its remains can still be seen at the bottom of the tower. During the 16th and 17th centuries the castle was greatly expanded, with a garden and separate walled garden being built, as well as the southern and eastern ranges which enclosed the courtyard, accessed by a drawbridge for security. There is a well known connection between the famous play Macbeth written by William Shakespeare and this castle. In the story Macbeth became thane of Cawdor and lived at the castle, however the truth is that King Macbeth of Scotland lived and died many years before the castle was even built. The 5th Earl of Cawdor has been quoted saying, "I wish the Bard had never written his damned play!" Today the castle has recently closed to the public but the gardens are still open. Please check with the venue directly if you wish to visit to ensure it is open. People have reported the normal claims which can be expected from a castle such as this. There are the normal tales of orbs and various ghostly sounds and sights, but there is one story which the castle is well known for and it keeps coming up again and again. 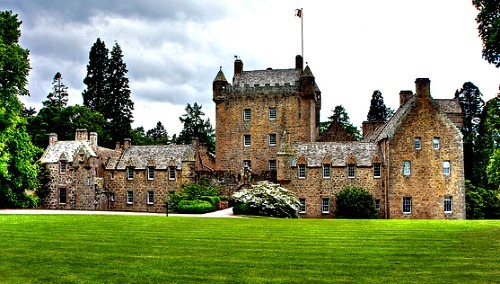 Cawdor Castle is thought to be haunted by the ghost of Muriel Calder, one of the daughters of the Earl of Calder who was in power here during the 18th century. There are two popular versions of how she died but they are only slightly different. The first version tells of how Muriel was in love with a member of a rival clan, and since this clan was a rival of her Calder family her father greatly disapproved. He told her she was not allowed to see her lover anymore but she would often sneak out of the castle and meet him in secret. Her father caught her sneaking out one night and she admitted that this had been going on for a while and she would not stay away from her love. A huge argument broke out between the two and it ended up with her father beating her and chasing her up to the top of the tower where she locked the door. She attempted to climb out the window and down the walls to escape but her father broke the door down just as she had climbed through the window arch and was hanging from the ledge. Her father, in the midst of his rage drew his sword and cut both of his daughters hands off in one swing, sending her falling to her death. The second version of the story is pretty much the same, except after the argument broke out he cut her hands off during it, instead of chasing her up the tower, so that she would never embrace her love again, though she died from blood loss shortly afterwards. People have claimed to have seen her apparition in the tower. She has been described as having long brown hair and wearing a blue dress, and of course not having any hands.